Happy New Year and welcome back! I hope you all had a good break and are ready for another great semester. As we transition from 2016 to 2017, I would like to encourage everyone to think about improving and mastering civil discourse. Since the deeply divisive and polarizing political campaign, I have received several reports of emotional abuse and harassment between faculty and staff, and between faculty and students because of political disagreements or assumptions. Just as we expect students to engage in appropriate dialogue, it is expected between faculty and those over whom they have power relationships. It was very disappointing to discover incidents of faculty criticizing either students or staff about the election results – even when they had no knowledge (as is appropriate) of the individuals voting record – not that it is EVER appropriate to criticize an individual for how they voted. Throughout our lives, there will always be circumstances where we disagree with someone; but we must disagree with respect and discourse, not emotional accusations and abuse. We are fortunate to work in an environment where inclusivity, diversity, and dialogue are valued. We are also fortunate to work on a college campus where the free expression of ideas and discourse about ideas are encouraged. Every student on this campus interacts with our college at some point in their academic career. As the faculty and staff, it is important that we show leadership in the area of constructive discourse and civility in our departments, offices, and classrooms. If you disagree with a colleague, please do so with respect, integrity, and acceptance. If you have a problem or feel emotionally abused or manipulated because of what you believe in (or what someone thinks you believe in), please seek out help. 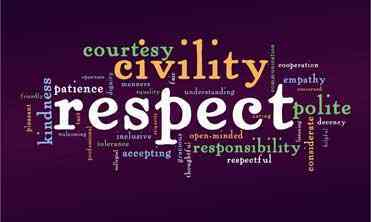 Finally, I encourage you to watch this video and think about what civility means to you. Remember, VOL MEANS ALL is not just a slogan; it’s our mission.